The brilliant Demon's Souls for the PlayStation 3 will keep its unique online experience intact for at least the next ten months in North America, publisher Atlus said today, extending the life of From Software's deviously hard role-playing game. Atlus USA has extended Demon's Souls' online service beyond the previously announced March 2011 (potential) cut off date. 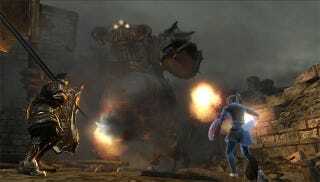 The publisher promises to support Demon's Souls servers until its second anniversary—October 6, 2011. And there's hope beyond that. "We will support the online servers for Demon's Souls as long as we possibly can, and we'll be as transparent about the entire process as possible, hence us constantly updating folks as to what to expect," said Atlus PR man Aram Jabbari. Atlus will also be switching the online servers to a Pure White Tendency mode for the holidays, a change that should extend into the new year. They also remind us, "Hey, Demon's Souls is a Greatest Hits game. How about buying a copy?"